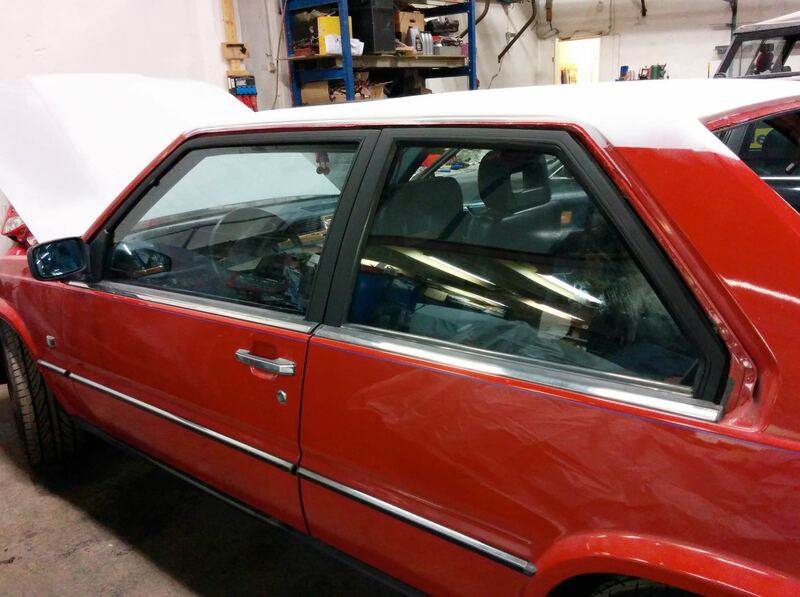 One of the common issues that effects most 780s after 25 years, especially in more humid climates, is rust around the rear side window frames. 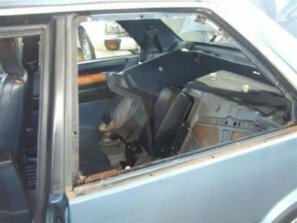 The rust is generally not noticeable at first and requires the removal of the rear seat and side panels to fully verify. 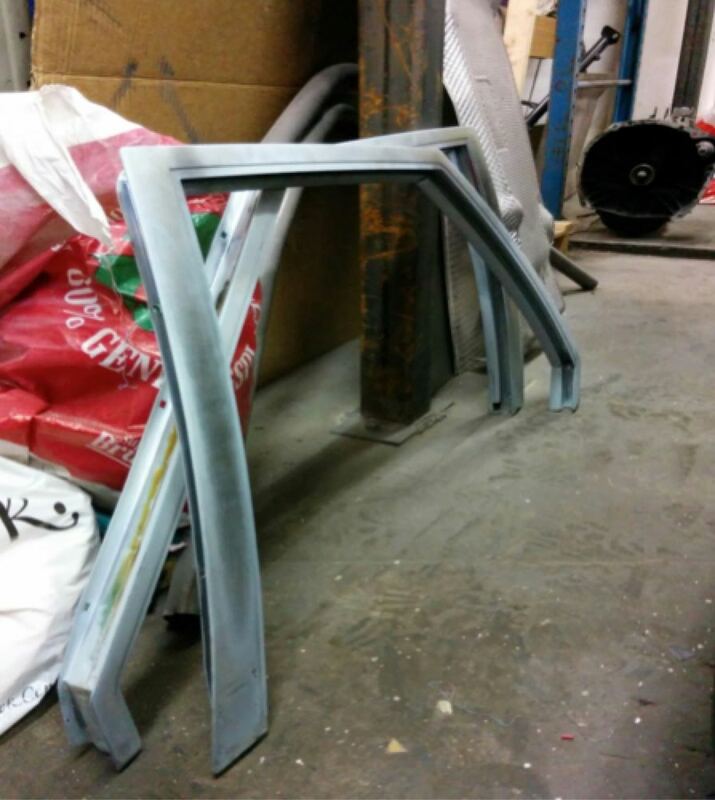 This document is created to give you some guidance in how to restore you rear side window frames in the best way possible within a reasonable budget. Since these frames are expensive and can sometimes be mended instead of replaced! Read though this whole document before you start so you don’t miss out on anything! The first operation that needs to be done is to remove the frames from the car. This is a one man job, but a helping hand is never a bad idea. The side windows are held on to the body of the car by a lot of Phillips head screws that is accessible from the inside once (sadly) most of the rear interior is removed. Start by removing the rear seat bottom cushion, followed by the rear seat backrest. The bottom is held by two clips, which require the cushion to be pushed back and then up. The rear seat backrest can then come out, it is held with several other clips. Next is the side panels, B-pillar panel, hat shelf and c-pillar trim. The side panels are hold on by clips and three screws, two in the armrest handle and one against the “floor”. You will also have to remove the lower seatbelt bracket and the plastic floor panel in the door opening. Take it easy as these are brittle clips and parts that can break easily. The b-pillar and hat shelf are pretty straight forward. And the c-pillar is a matter of two screws behind the hand-grip and one behind the rear seat backseat rest. Now you will see the screw that goes all the way around the frame. I don’t remember the exact amount, but it’s about 15 of them. The frame is also usually glued in place (or you can say that whatever was used for sealing the frame have turned in to glue over the years, in other words it will be stuck). I used a piece of Delrin plastic shaped to chisel to carefully “hack” my way through the glue on the upper and side parts of the frame (from the inside of the car). Once I felt that I was though all the way around I carefully started to pry and push on the frame at the top to make it come out. You will probably need a bit of force, but not too much since you don’t want to damage the frame. 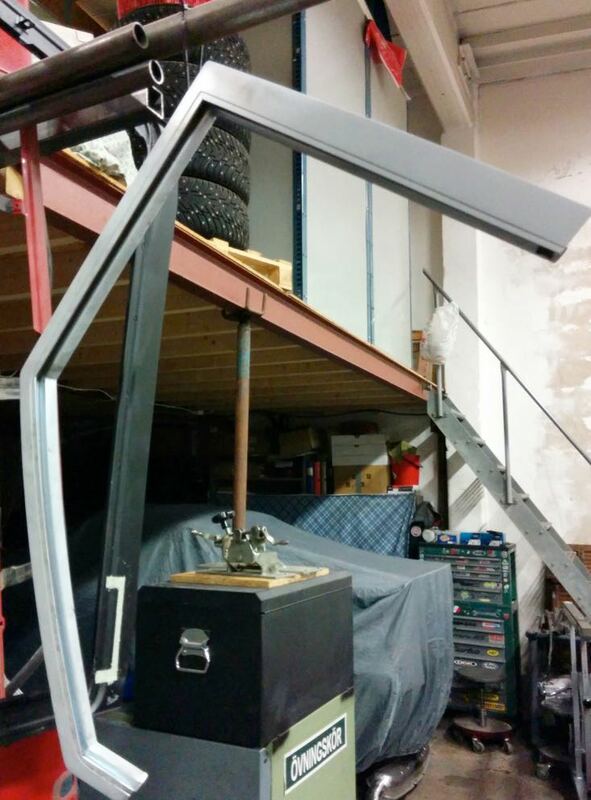 If the frame doesn’t move by the force you apply by hand, you will need to “hack” a bit more. When you feel that the frame is moving outwards move yourself to the outside and lifts/ wiggles the frame out. Next you will need a table to lay the frame on. Inspect the damage that the ruts have done and start with the disassembling of the frame. Mine in the picture below had rusted in the bottom as the welded patch pieces can tell. Start (if possible) with the two screws at the bottom of the frame. Use penetrating fluid if needed. If the screws won’t give up they can easily be drilled out. Once the two screws are out remove the lower section of the frame and bend slightly in the large piece of frame to free the glass rubber and make the disassemble of the glass easier. Then pull and wiggle the glass out of the frame downwards trough where the lower section used to be. Something soft to pry with could be of big help to free the rubber more easily. Once the frames are free from all the other components you can start the restoration depending on the state of it. Mine had, as the picture above tells, rusted through the outer surface of the lower end. Also the lower section plate that holds the window in was pretty much gone! The next thing I did was to remove the rust and all the paint with a nice sandblast. With the rust gone, cut out and weld any holes that will be visible when the frame is in the car. As always don’t weld more than necessary since it only give you more work that doesn’t pay off in any way other than your sweat and tears. When the frames is welded, grinded and as straight as it can be its time to let it undergo a zinc coat treatment or electro galvanization as its also called. This is a treatment that involves dipping the frame in various acids to remove all rust particles and replace it with a nice layer of zinc. Google the web to find a shop close to you that can do this sort of thing. In the process you can often choose from different colors. There is one that is “gold-like” and is often what is seen on new nuts and bolts. At the shop closest to me you can choose from gold, silver and black. Black is often the smartest way to go in this case, since the frames are dark once finished. Mine ended up silver since the shop forgot how what I told them! But this didn’t matter too much. The idea is just to keep rust away even in places spray or other rust removers can’t get to. 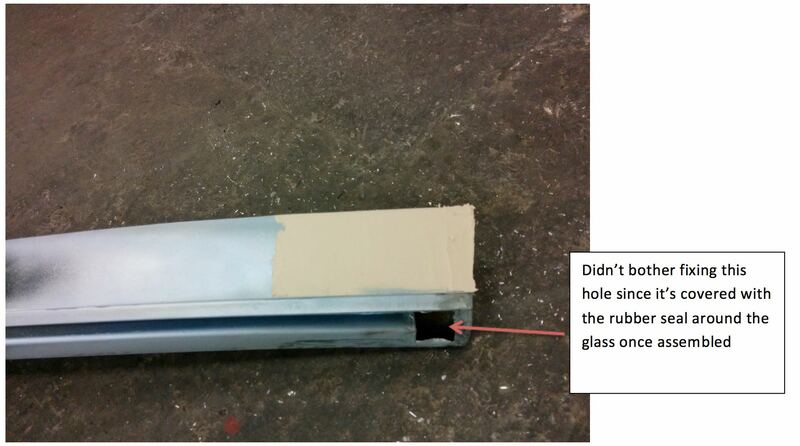 After welding and patching, you probably ended up with some uneven or to flat surfaces on the frames. Fix this with some zinc compatible filler! Then spray prime the frames! Mostly just to cover the filler. 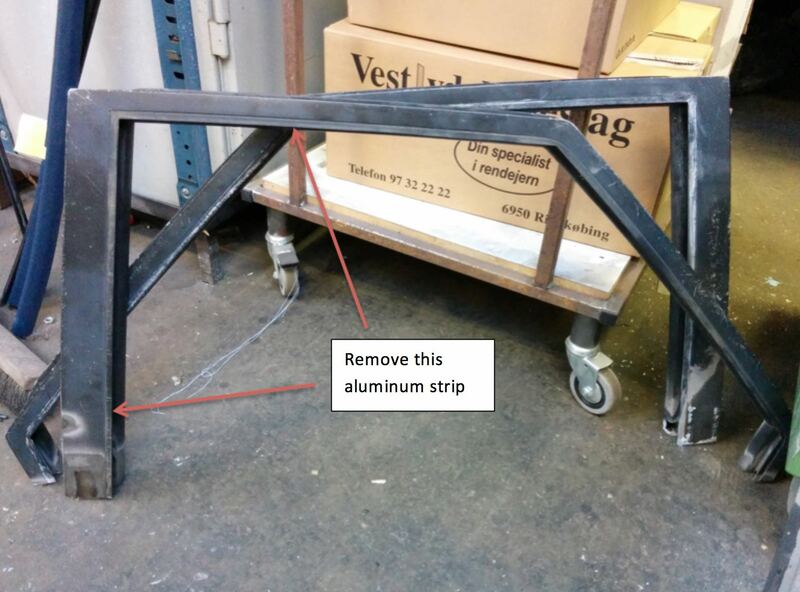 If you make your own they will need to undergo the same process of treatment as the frames! My finished frames! I painted them in matt black along with the front frames!